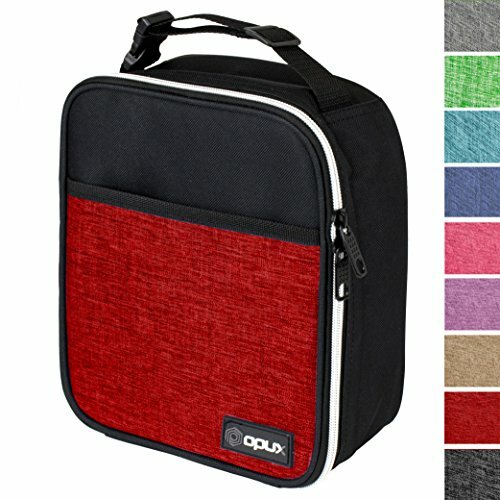 This durable, functional, and easy to use Premium Compact Lunch Bag by OPUX is perfect for young boys and girls to take food/snacks with them to school and men and women to bring lunch to work or on the go. These lunch bags are lined with thermal insulated lining and are spacious enough to fit one person's lunch. Contains side pockets to carry extra items and a multi-functional strap with a buckle, making the lunch bag easy to carry. Measures at 10" x 8" x 3.7" (L x W x H) and is made from high-quality nylon and polyester fabric with reinforced zippers, ensuring maximum durability. Ideal for children to take food/snacks to school and adult men and women to bring lunch at work or on the go. The perfect reusable lunch bag with ample room for meals, snacks, and beverages. KEEPS FOOD HOT/COLD - Equipped with eco-friendly PEVA lining that is soft and easy to clean. Just wipe it with a wet cloth and it's good as new. Spacious enough to fit 6 cans of soda, or one person's lunch and more! If that's not enough, there is a front pocket that allows you to store extra items, such as utensils and napkins. FUNCTIONAL DESIGN - Front and side pockets to carry extra items and multi-functional strap with buckle makes the lunch bag easy to carry. Lunch bag can be carried by hand or be tied to backpack at the handle. QUALITY AND DURABLE CONSTRUCTION - Made with high-quality nylon and polyester fabric and reinforced zippers to ensure maximum durability. SIZE: 10" x 8" x 3.7" (L x W x H) | Available in 16 colors!